The use of superlatives to describe cancer drugs in news articles as “breakthrough,” “revolutionary,” “miracle” or in other grandiose terms was common even when drugs were not yet approved, had no clinical data or not yet shown overall survival benefits, according to an article published online by JAMA Oncology (JAMA Oncol. Published online October 29, 2015). Where do these journalists and physicians get their information about investigational drugs; i.e., drugs that have not yet been approved by the FDA? The pharmaceutical industry, of course! Journalists get their information from pharma press releases. A March 2009 Survey of American Health Care Journalists (AHCJ), which found -- among other things -- that just under half (44%) of staff journalists participating in the survey say that their organization sometimes (34%) or frequently (10%) bases stories on news releases without substantial additional reporting (read "Academics Exaggerate, Journalists Regurgitate."). I suspect journalists regurgitate the superlatives from press releases. They also regurgitate other dubious bits of information. Some time ago, Boehringer violated Clauses 2, 9.1, 3.2, 22.1 and 22.2 of the ABPI Code of Practice (see "Promotion of Pradaxa by Boehringer Ingelheim Breached ABPI Code of Practice"). At the core of the case were stories published in UK newspapers based upon a BI press release. BI also provided reporters with access to paid physicians and patient spokespersons. The news articles made some great marketing statements that BI could never make, such as referring to Pradaxa as a "super pill" and a "revolutionary drug." The stories also dissed the competition (warfarin) by referring to it as "rat poison." Physicians get their information about investigational drugs from CME courses, 50% of which are sponsored by the pharma industry, and from "Key Opinion Leaders" who are expert physicians paid by pharma to spread the news to other physicians. 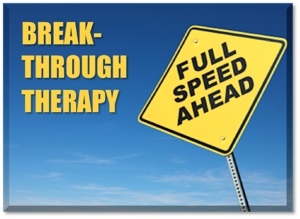 In some cases "breakthrough" is an appropriate term if the investigative drug is given that status by the FDA. In 2014, FDA approved 9 "breakthrough" drugs -- 22% of all drugs approved that year. The FDA also uses other designations that marketers can use to their advantage. "Novel New Drugs" are also given fast-track approval. The authors of the JAMA Oncology report cite one limitation of their work: it was conducted 3 weeks after the 2015 American Society of Clinical Oncology conference. "As such," the author point out, "it may not reflect the use of these terms at other times, as well as in other years." Imagine the superlatives flying around the traditional media -- not to mention social media -- before and during that conference!